EB photo above courtesy Matt Kleiman. 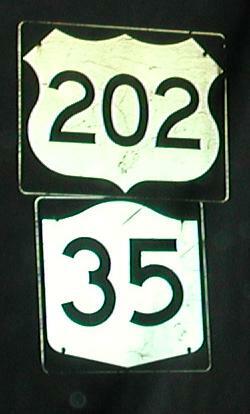 Most of NY 35 is duplexed with US 202, but that's 202's fault. 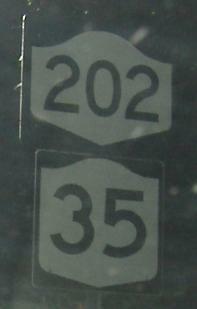 Strange font on US 202/NY 35 EB, and the banners definitely don't match the sign. Even black on white would be better. 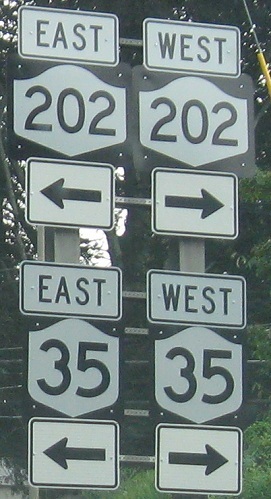 On either side of the Taconic Parkway, US 202 reverts to NY status. Not. 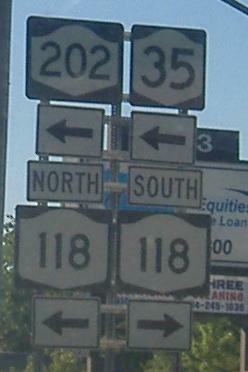 These are EB, but NY doesn't like to put directional banners on the through routes. 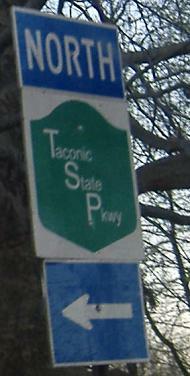 And this one is on NY 132 SB, only ½ mile east of the Taconic. From the south (NY 35) side of the Amawalk Reservoir - the old signs are on the US 202 page, linked below. As is usual for me, I randomly got great detail on a bird landing on the stone wall of the runoff channel. East of there, NY 35 is finally its own route. WB at I-684, the assembly on the right looks fine, with a "Saw Mill Parkway" shield ("River" is dropped in common usage), NY 117, and most importantly, 684. There are also these signs on the far left side, not even angled properly (almost facing SB offramp traffic), with a far uglier NY 117 (stretched hump) and useless "SMP".